As some of you will know we are playing in the Kindred Clubs Shield final this Sunday. We are looking for plenty of support on the day as well as caddies for those that wish to or can help. We have a very good chance of winning this again so please rally round and support our team. BBQ food available on the day for caddies and supporters and of course our bar will be open. The committee and team players all look forward to your support. Please show your support once again and in our 60th year how good would it be to win the Shield again!!! 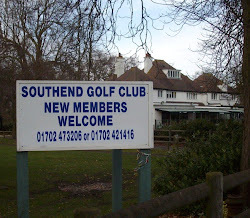 Welcome to Southend Golf Club, We are based in Belfairs Woods, Leigh on Sea. New members are always welcome. You will find all our latest news, scores and more on this webpage. We are also on Facebook. Current members can receive an incentive payment for introducing any new member (must not have been a previous member, and does not include cadets). Please contact Niven Dimmer for further information.